They say it's all in the details! 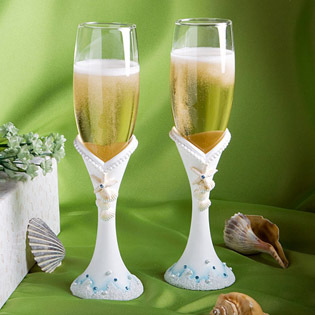 So why not make a splash by adding some decorative details with lasting appeal to your wedding's beach motif with these bride and groom champagne flutes! From Fashioncraft's exclusive Finishing Touches Collection, each measures 9 .75" tall x 2 .75" in diameter and has a clear glass flute top nestled in a white poly resin base with a dipped beaded design top, elegant carved seashells, starfish and a faux pearl accent on the stem, a sea foam blue wave design on the base and blue rhinestones sprinkled throughout. Truly a treasure to behold, each set of two bride and groom champagne flutes comes delightfully packaged in a white with ivory seashell design gift box with a clear acetate window front for beautiful display and storage. These flutes are so beautiful, when I received them I had tears in my eyes. Love this beach theme for my future wedding day. We love the champagne glasses and cake knife set. These will be used for wedding in October, 2018. Thanks so much. We bought these for our beach wedding. They are even prettier than the picture and look much more expensive than the price I paid! I am very pleased with this purchase! The picture does not give them justice. . So much prettier in person. Will be perfect for my wedding next year.